The days are getting longer, the sun is shining brighter, and the temperature is rising – spring is around the corner! Spring means many things I love. My dog and I can start taking longer walks more comfortably outside. He has all the spring smells to stick his nose in and I can admire the flowers starting to bloom and the green returning to the trees. However, spring also means that ticks will be out in full force. Ticks do not die in the winter; they just wait for the first warm day. Because ticks can be active as long as ground temperatures are above 45 degrees fahrenheit, ticks can be active during our mild winter weather as well but spring guarantees they will be consistently active, hungry, and looking for meals. Ticks, who are close relatives of spiders, wait for animals (or people) to crawl onto from the tips of blades of grass, shrubs, leafs, and short trees. This means even if you are in the city, you can still encounter ticks waiting for you or your pet. In fact, there are certain ticks that can live and reproduce inside your house so even indoor only pets can be exposed to ticks. Exposure to ticks and their diseases is likely greater in dogs than in people because dogs spend more time in the yard or roaming in areas where they are likely to encounter ticks. If you are like me, you can remember a time when we would pull ticks off of ourselves and our dogs and not worry about anything further. Unfortunately, ticks have been found to be carriers of many diseases and these diseases have become more widespread over time. Lyme disease, caused by the spirochete bacterium, Borrelia burgdorferi, is one of the most important and prevalent diseases spread by ticks, although there are a number of diseases that ticks can pass to us or our four-legged friends. According to the Companion Animal Parasite Council ,1 in 14 pets tested in Fairfax County were positive for Lyme disease in 2017. Additionally, as many as 75% of unvaccinated dogs will eventually test positive for Lyme disease. Lyme disease is most commonly passed through the bite of the deer tick, although other ticks may also pass this disease. The bacteria is carried to many places in the body through the bloodstream but are most likely to go to the joints in dogs. It is often more difficult to detect Lyme disease in our pets than in people because the characteristic “bulls-eye” rash does not develop in dogs or cats. Signs of Lyme disease in dogs may not show up right away and may be similar to other diseases. Symptoms include generalized pain, decreased appetite, fever, and limping. If untreated, these symptoms may eventually disappear, only to recur weeks or months later. Due to the subtlety of symptoms, some pets can be infected for over a year before they finally show obvious symptoms. 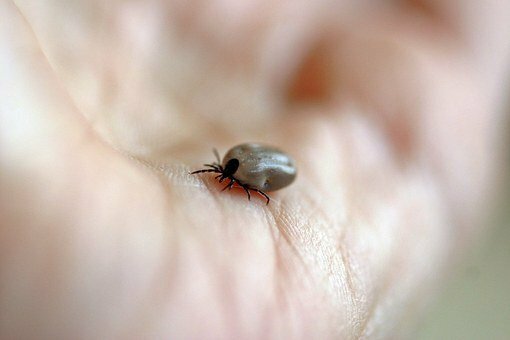 By this time, Lyme disease may be widespread throughout the body. There is also a fatal version of Lyme disease, called Lyme nephritis, which can cause the kidneys to fail. There is good news! Your veterinarian can test and treat your pet for Lyme disease. Of course we test for Lyme disease any time we suspect the possibility of infection. We also test for Lyme disease with your annual heartworm test, even in apparently healthy dogs, due to the difficulty in recognizing the signs of infection in our pets. When your veterinarian finds evidence of active Lyme disease, your dog will be prescribed a 4 week course of antibiotics. Sometimes the first course of treatment may need to be repeated or an additional antibiotic may be needed, especially if the infection has been in the body for a long time. Occasionally, the original infection will recur and your pet can always become reinfected by being bitten by another infected tick. So what else can we do to help our four-legged friends? One of the most important things we can do for our pets is to prevent them from becoming infected in the first place, which includes the use of tick preventatives and vaccination. Keeping your pets from the thick underbrush, tall grasses and wooded areas and checking your pet immediately after being outside for any ticks will help prevent infection. In fact, our pets should be checked daily for ticks, year round. Vaccination against Lyme disease is also recommended for pets in our area who will be outside often because the disease is so common here. Finally, your pet should be on a monthly tick preventative. Tick preventatives come in many forms and modes of action. Many of the preventatives do not repel ticks from your pet. What they do is kill the tick once it has bitten and that is effective enough to prevent transmission. If you find a tick on your pet or have questions about vaccination or preventatives, please give us a call at 703-820-2557. Our medical team can make specific recommendations tailored to you and your pet so that you can enjoy the beautiful weather together!